A prepper is someone who prepares for the future. It’s really as simple as that. I live in Houston, Texas and in September of 2008 hurricane, Ike made its way through the city, wreaking havoc. It was one of the costliest tropical cyclones on record, with billions of dollars in damage. When all was said and done, 196 people died and 16 people were missing and presumed dead. The aftermath was a truly eye-opening experience. Every store was closed as there was no food left on the shelves. There was no gas station with any gas to sell, so none were opened. The roads were closed so it wasn’t like supply trucks could get in or out of the city. 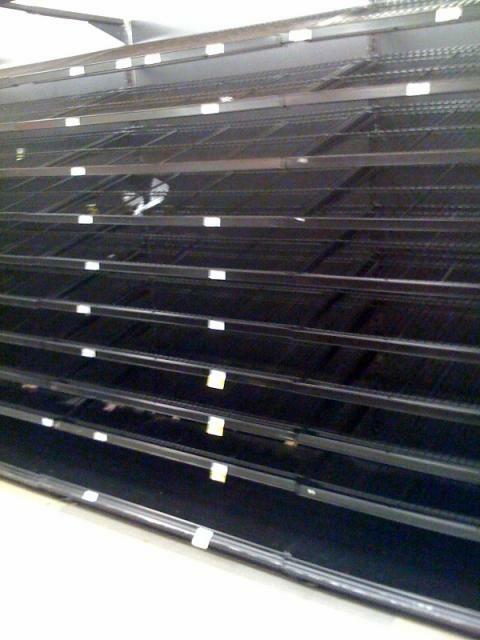 This is what my store shelves looked like at the Kroger by my house a week after the storm hit. It wasn’t that stores didn’t want to sell you items you needed, there was just nothing to give. Some homes were without power for two weeks. No power means no AC in Houston’s hot and humid climate. That also means no doing laundry or no hot water. This wasn’t in some far off place, or some 3rd world country, this was in the 4th largest city in America. People had no power, no food, no water. Preppers are people just like you and me who prepare for these type of events. They love their family and want to take care of them during the good times and the bad. They think these things through and plan for future events and when something like this does happen, they are ready. Their family won’t have to do without water, food or power, because preppers are ready for cataclysmic events.